I found For the Love to be a delightful surprise, full of grace, laughter, and memorable moments. 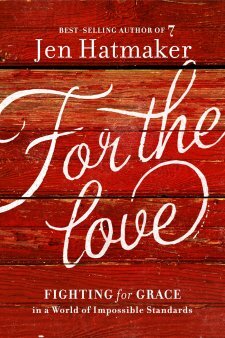 Jen Hatmaker has written something very different from other similarly themed books that seem to be flooding the book stores. I think the difference is in Hatmaker’s ability to tone down the seriousness and amp up the humor. After all, laughter is the best medicine for whatever ails you. The best way to describe For the Love is to call it what it is: Jen Hatmaker on her soap box. I mean no insult by saying that, but while grace is a central theme in this book, no constant train of thought connects the chapters. If she has been longing to say something, she waited to say it this book. There is hardly an area of life she doesn’t speak to. Chapters filled with hilarity will leave you snorting, followed by chapters that might ruffle your feathers a bit. Hatmaker shares from her heart, but includes heavy doses of her sense of humor. I loved it, and I haven’t always been her biggest fan. Early in the book she speaks to the idea that we have been sold a lie that we can do everything and do it with perfection. Hatmaker urges readers to recognize those things that we just need to let go. I appreciated this advice as a person who finds a yes slipping out of my mouth before I realize it! This book was a fun read that also adds value. It is not a deep theological study of anything, but will still tug at your heart-strings. I was given a complimentary copy of this book by its publisher and BookLookBloggers in exchange for an honest review. I have not been compensated in any way and all opinions are my own.